Boeing 747s, the Queen of the Skies, are rapidly being replaced by their younger princesses of B777 for its fuel efficiency. Capacity is reduced: First Class went down from 9 seats to 6. The old Business Class herringbone layout is phased out in favor of the new Cirrus seats. Around 30-34 Premium Economy seats are introduced, and now the Economy seats are confined within only the last segment of the aircraft, cleaved by the galley and an exit row. When you look at the layout schemes, you will realize how shortened the Economy class has become, reminiscent of JAL’s mostly Business Class seats during the mid 80s. I will say that the Premium Economy is worth the extra dollars. If nothing else, the ability to recline one’s seat again is a plus, compared to the current seat model that does not; instead, the seat slides forward, thus putting a lot of pressure on one’s knees. I am among the minority frequent flyers who prefers bulkhead seating, and this one does not disappoint. The layout in this class is 2-4-2, but the first row coincides with the Exit Row. This means that the left aisle’s first row of 2 seats, at number 31A and 31C, have a generous leg room. The middle aisle too has a generous legroom; unless you are a 6-foot person, your leg will never touch the wall in front of you. This design is perhaps functional, because I find out quickly that there is only one restroom in the Premium Economy cabin, located on the right aisle; thus, the extra space in front of the middle aisle bulkhead seats serves as a path for passengers on the left aisle to cross over. In addition, Business Class passengers and Flight Attendants also frequently uses this path. What surprises me is that the bulkhead wall lacks the telltale sign of hardware needed to latch a . . . bassinet! I suppose with this space expected to be used as a crossover path, putting a bassinet will interfere with that. The right aisle does not start until seat 32H and 32K, and although also bulkhead seats, they have a standard bulkhead legroom, because instead of the exit row path, they are placed directly behind the toilet. The placement of the toilet door on the opposite of these seats actually works well for everybody: Toilet door opens to the area directly in front of the exit door. People congregating for the toilet will not bother anybody in the vicinity too much, unlike the old B747 Economy exit row restrooms. The left aisle actually has a toilet on their side, but it is located between the Premium Economy and the Economy, and behind the curtain. Technically it is for the Economy section, but I suppose PrEcon passengers on that aisle can sneak in quickly if they wish; after all, during this flight, I see a couple of Biz class people sneaking into the Premium Economy to use the segment’s one and only toilet. Upon seated, passengers are handed bottled water, followed by hot towel service. The seat is an improvement from the current Economy seat, although these Premium Economy seats are not new. I recall sitting in one of these in my many NRT-HKG flights in the mid 2000s. I used to abhor the design of these seats, because the leg rest does not make sense at all: There is cushion support for your leg but only until mid-calf. There is a metal part down at the end that, when opened, is supposed to be upon where your feet should rest, but this means you will have to bend your knees. It makes an awkward footrest, but hey, if this is what they offer at this segment, I will take it. Plus, I am able to remedy the situation: I place a pillow on the metal part so my legs could continue to rest on it (forget using the metal as a footrest.) Lacking a pillow, place a cloth on this metal part, because it will be cold especially when your legs are exposed. Word has it that Business Class meal would be served for Premium Economy, but what I had was instead a slight mix: The Menu card size increased. Wines and spirits are listed in the back. Meal still comes in the Economy class tray, instead of served individually, but the main entrée itself is contained within a porcelain dish instead of a shape-changing aluminum dish. Ice cream comes with the food tray. By the time one is finished with the main entrée, the ice cream will be soft enough to dig easily. 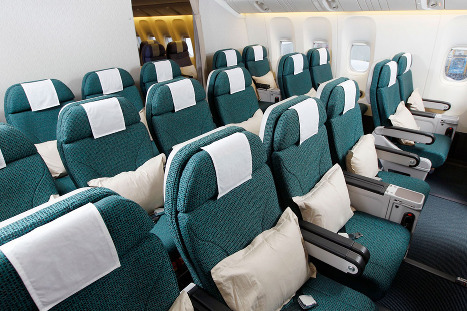 Premium Economy in Cathay’s SFO/HKG is in its infancy. It just started earlier this month, September 2012. The LAX/HKG Premium Economy commences on November 1, 2012. In this flight, I am extremely fortunate to have chosen an aisle seat at the bulkhead middle aisle, but with no neighbors at all. I ended up shifting to the middle seat, and then spread out to the two flanking seats: Aaah, Extreme Premium Economy. I am convinced that as this segment becomes more popular, such luxury will disappear very quickly. This entry was posted in Airlines, Blog, Travels and tagged airlines, cathay pacific, premium economy seats, sfo by bloompy. Bookmark the permalink.